What are the Best Online Master's in Human and Family Development Programs? What Else Can I Expect From an Online Master's in Human and Family Development Program? Jobs in human and family development are projected to see above-average growth rates through 2024, ranging from 8-22%, depending on the profession. Graduates with this degree can work as counselors, administrators, and social workers in settings that include hospitals, agencies, schools, government, and private practice. Whether you are interested in working with youth, families, or communities, an online master's degree in human and family development can help you achieve your goals. Many of the jobs in the profession require a master's degree. A number of degrees are available entirely online, allowing you to continue to work or participate in fieldwork while completing a program. Most degrees can be earned in less than three years. Each online master's in human and family development has different application requirements, but many do not require previous work experience. It's common for students to complete a statement of professional goals or statement of purpose, where you outline how you plan to use a human and family development degree in a new career. There are many different programs in the field of human and family development, with specific topics such as family and community sciences, youth development, and human and family services administration. After narrowing down your focus, you should check to see if classes are synchronous or asynchronous and determine the best fit for your schedule. Students should also consider what online student support services a school offers, tuition, and length of time required to complete the degree. CAN I WORK WHILE I COMPLETE MY ONLINE MASTER'S IN HUMAN AND FAMILY DEVELOPMENT? 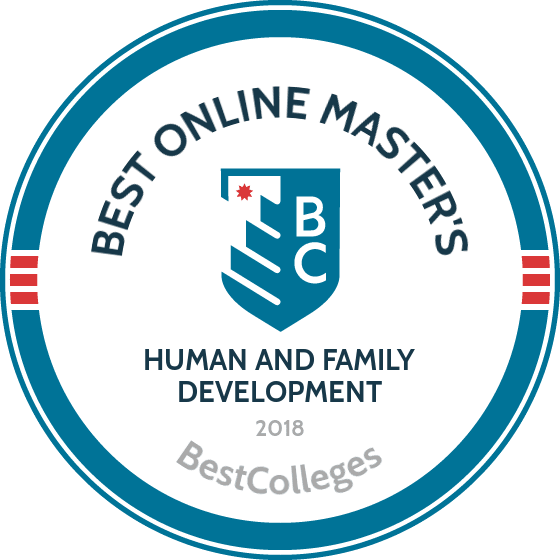 Many of the best online human and family development master's degrees are completely online, allowing students to continue to work while completing the program. It's common for schools to offer part-time or full-time enrollment opportunities, which gives students the flexibility to increase or decrease the number of courses they are taking as their schedule permits. UF is ranked the country’s ninth best public university in 2018 by U.S. News & World Report. The school offers a 30-credit online master’s of science in youth development, and family sciences that taught by the same leading faculty who teach on-campus classes. UF offers two track options: one focusing on family and youth development and the other offering a concentration in nonprofit organizational development. These programs includes courses on a variety of topics, such as adolescent problematic behavior, youth and family relationships, and theories of family development, systems, and change. Full-time students can earn their degree in three years. Online classes are delivered asynchronously, allowing students to complete coursework at their own pace. Applicants must have a bachelor’s degree from a regionally accredited U.S. school and a minimum undergraduate GPA of 3.0 to be considered. UF's admissions staff reviews applications holistically. Vanderbilt is a private university that boasts nearly 140,000 alumni, including 21 members of Congress, 12 governors, and two U.S. Vice Presidents. The school offers an online master's of education degree with a school counseling specialization. This 48-credit online master's in human development counseling can be completed in two to three years of full-time study. All students must complete three internship terms and two on-campus immersion experiences in Nashville, Tennessee. The three internship terms can be completed alongside weekly online classes directed by Vanderbilt University’s Peabody College faculty. The curriculum emphasizes counseling practice, social emotional learning, and program management, and includes coursework that prepares students for professional roles as K-12 school counselors. Vanderbilt is regionally accredited by the Southern Association of Colleges and Schools Commission on Colleges and Peabody College is nationally accredited by the Council for the Accreditation of Educator Preparation (CAEP). North Carolina State offers more than 90 online and distance education programs, including an online human development and family studies graduate program. The MS in family life and youth development requires students to earn 36 credits. Students can specialize in developmental area such as youth or family development, or choose to focus on development across the lifespan. The online program includes asynchronous and synchronous courses that are scheduled in the evenings. Online students must be present for synchronous courses at specified times. The virtual classroom is delivered electronically through live seminar streaming and video-conferencing. Students in the program gain theoretical and practical knowledge that prepares them for a variety of careers in areas such as community agencies, schools, social service organizations, and correctional facilities. Courses include complex family issues and environmental influences on the family. Applicants must provide GRE scores, three letters of recommendation, and a personal statement. GW was founded in 1821 as a private research university. Today, the school spans 14 undergraduate and graduate colleges and schools in Washington, D.C.'s Foggy Bottom neighborhood. The school offers a master's of arts in education and human development in the field of educational technology leadership that is ideal for students pursuing careers in human service fields that focus on computers and information delivery technologies. GW's 36-credit online master's in child development program has a staff with more than 25 years of online teaching experience. The program emphasizes a research-based approach to education, technology, and leadership that enables students to pursue successful careers in the fields of learning or technology. The school also offers 18-credit online graduate certificates, allowing students to cultivate a solid foundation in educational technology that may be transferred toward their master's degree. GW is regionally accredited by the Middle States Commission on Higher Education. Nebraska-Lincoln has been a leader in higher education for almost 150 years. The university offers a variety of online degree programs including a master’s degree in human development and family studies online. The growing field of human development offers rewarding careers that focus on the interaction between family systems and environmental influences. The online MS in human and family services administration from Nebraska equips students with the skills necessary to develop, implement, and evaluate programs. The administrative component emphasizes knowledge in human resources, management, and public policies. The program is 36 credits and consists of family studies and public administration courses. Public administration courses are part of the university’s public administration degree at the Omaha location and are taught online by Omaha faculty. Online courses are delivered through the Blackboard learning management system, and students engage in a variety of instructional methods including asynchronous web-based assignments and synchronous components such as videoconferencing. ASU is a public metropolitan research university in Phoenix, Arizona, that in 2018 marked its third consecutive year as the number one ranked most innovative school in America by U.S. News & World Report. The school offers a 30-credit online master of science and family development as a non-thesis program that can be completed in just 15 months. The curriculum includes 12 credits of required core courses on topics like diversity and social statistics as well as nine hours of structured topic classes on marriage, family relationships, parenting. Students must also complete three capstone classes, culminating in a final class to be taken during the program’s last semester. Applicants must have a minimum GPA of 3.0 to be considered. ASU is regionally accredited by the Higher Learning Commission. OSU, the flagship school of the Oklahoma State University System, offers an online 36-credit online master's of science in human development and family science program. The school offers students a flexible schedule of classes taught by top-notch human development and family science faculty. This master's degree in child development online includes a 30-credit curriculum with classes on a variety of topics, such as interpersonal relationships and resilience in families. Students must also complete three credits of electives an a three-credit non-thesis creative component. Students are encouraged to apply three months prior to their semester of choice. Applicants must submit three letters of recommendation, a resume, a statement of purpose, and official transcripts to be considered. OSU is regionally accredited by the Higher Learning Commission. Liberty is a private, nonprofit Christian university that was founded in 1971 in Lynchburg, Virginia. The school offers an online master's of arts in pastoral counseling with a focus on marriage & family studies. This online master's degree prepares students for careers as church counselors, non-licensed counselors, marriage/family counselors or military chaplains. Students can apply up to 18 credits of coursework from another regionally approved university towards their degree upon approval. Liberty also offers optional intensives that allow online learners to visit campus for a selected class and to network with their peers, and professors. Applicants into this online master's in child development online program must have a minimum GPA of 2.0 to be considered. Liberty is regionally accredited by the Southern Association of Colleges and Schools Commission on Colleges. Iowa State is a public flagship university that was founded in 1858 in Ames, Iowa. The school offers an online master's of family consumer sciences that emphasizes the skills needed to serve young people. In addition to this 36-credit online master's in child development degree, the school also offers a youth development specialist graduate certificate and a youth program management and evaluation graduate certificate. Both master's students and graduate certificate students share courses, although the certificate curricula consist of just 12 credits each. The master's degree curriculum includes an instructor-approved internship in college teaching, research, or similar professional experience tailored for the students transition to professional life. Applicants must have a minimum GPA of 3.0 for unrestricted admission and must submit GRE scores. Iowa State is regionally accredited by the Higher Learning Commission. Missouri-Columbia, often referred to as Mizzou, is one the nation’s most prestigious public research universities and offers a variety of programs including 89 innovative online degree programs. The online master’s in human development and family studies from Mizzou is 36 credits and the estimated tuition of the program is $19,620. The MA in human development and family studies with an emphasis in family and community services provides students with a strong theoretical foundation in the areas of family and ecological systems. Courses emphasize the interactional behaviors and relationships among groups of people and environments across the lifespan. Students learn how to be effective leaders and gain skills in program design and implementation. Courses include family resource management and family crises intervention. Students are required to complete two course electives, which allows them to gain knowledge in specialized areas such as youth culture and working with military families. Amberton is a nonprofit Christian school located in the Dallas/Ft. Worth metropolitan area. The school offers an online master's of science in family studies that merges the fields of counseling and development while emphasizing family life, and education. This 36-credit hybrid master's degree in child development includes 24 credits of on-campus requirements in Garland, Texas, and 12 credits of online coursework. Students learn the dynamics of the family system and its interaction within the larger social systems of our society. The curriculum includes courses on topics like lifespan development, families in crisis, and human sexuality, as well as 12 credits of counseling electives. Applicants must have a minimum GPA of 3.0 to be considered. Amberton is regionally accredited by the Southern Association of Colleges and Schools Commission on Colleges. Kansas State is a research institution that specializes in providing an education rooted in the promotion of diverse perspectives, creativity, and global upward mobility. The school’s global campus utilizes innovative technology to reach distance learners around the world. The online human development and family studies degree provides students with a foundation in family and community services, program implementation and management, and family dynamics. The program emphasizes human development across the lifespan, and students learn to incorporate the needs of families at various life stages in the design and evaluation of community programs. The master’s degree in family and community services is 36 credits, and online courses are taught by faculty from several land-grant universities across the nation. This unique approach to online learning creates learning opportunities, and students are exposed to a variety of diverse perspectives from leading educators in the field. Missouri State provides an education with an emphasis in public affairs. The university offers a variety of degrees that can be completed entirely online, including a master’s degree in human development and family studies online. Students enrolled in the program choose a third of their courses and can complete the degree in three semesters. The customizable MS degree in early childhood and family development is a 32 credit program and prepares students for careers in a variety of settings, including schools and community and social agencies. Classes include family advocacy, family literacy, educational role of play, and more. Courses are delivered through Blackboard. Student resources include Blackboard support, career resources, and an admissions checklist. Students are encouraged to complete the university’s online learning readiness survey to determine if online learning is a good fit for them. Bryan is a private Christian liberal arts college that was founded in 1925 in Dayton, Tennessee. The school offers an online master's of education in child and family studies that is ideal for those pursuing graduate study in the field of human services. This 36-credit online master's in child development students may take up to two accelerated, nine-week classes at a time allowing students to earn their degree in just 18 months. The curriculum includes child and family studies classes on a variety of topics, such as education in a pluralistic society and family and community health. Students must also complete one mandatory elective and a final research-driven class. Bryan considers those with backgrounds in psychology, education, youth ministry, and social work to be especially good fits, although the school welcomes applicants from multiple backgrounds. Bryan is regionally accredited by the Southern Association of Colleges and Schools Commission on Colleges. Texas Tech is located in Lubbock. The university’s Worldwide eLearning program includes more than 60 online academic programs, and students have the opportunity to pursue career goals remotely through Blackboard. The online human development and family studies degree available through Texas Tech is part of the Great Plains Interactive Distance Education Alliance, a collaborative online learning program that incorporates courses from several universities to create one convenient and affordable degree. The MS in human development and family studies with an emphasis on gerontology is available fully online, and coursework focuses on adult development and aging from a family systems perspective. A variety of electives are offered that are designed to reflect student’s interests and professional specialty areas, such as spirituality and aging, gender and aging, and gerontechnology. The curriculum focuses on human development theories, family theories, research methods, and statistics. Southern Mississippi was founded in Hattiesburg in 1910 as a teacher training college. For more than 100 years, the university has provided quality education. The university offers numerous online graduate degrees including a master’s degree in human development and family studies online. The 37 hour program is designed for professionals with an interest in working with families to promote healthy development through education and community engagement. The MS in child and family studies is delivered fully online, and coursework is completed asynchronously through discussion forums and written assignments. Some courses include synchronous components, which requires online student participation in live videoconferencing at specified times. The online curriculum is reading and writing intensive and emphasizes a systemic approach to understanding family dynamics. Courses include parenting across the lifespan, family advocacy, and program evaluation and assessment. Graduates are prepared for careers as early childhood educators, child life specialists, family program administrators, and more. UA is the flagship campus of the Arkansas public university system. The school offers an entirely online master's of science in human environmental sciences with two separate degree tracks — thesis or non-thesis. Both online programs can be completed in two years and require GRE scores for admission. However, one degree option requires a comprehensive final exam and 33 credits to complete, while the other includes a student-directed thesis and 30 credits of coursework. UA’s master's degree in child development offers three concentrations: apparel merchandising and product development, human development/family studies, and general human environmental sciences. UA is regionally accredited by the Higher Learning Commission. This online master's in child development and family studies program is also accredited by the American Association of Family & Consumer Sciences. Ball State, a public research school founded by Muncie, Indiana's industrialist Ball brothers in 1917, offers an online master's degree in educational psychology that is ideal for teachers, child care personnel, and school administrators. This 30-credit online master's in child development includes 18 credits of general education requirements and 12 credits of human development specialization courses. The curriculum includes classes in advanced educational psychology and tests and measurements. Ball State also offers certificates in gifted and talented education, human development and learning, and neuropsychology. Students earning certificates may apply these credits towards their master's degree if they choose. Applicants must have a minimum GPA of 2.75 or a cumulative GPA of at least 3.0 in the latter half of a student's undergraduate studies to be considered. Ball State is regionally accredited by the Higher Learning Commission. North Dakota State, located in Fargo, is a land-grant research institution that offers an exceptional academic experience on-campus and online. As a leader among online human development and family studies graduate programs, NDSU’s online MS in human development and family science prepares students to work with youth in a variety of settings such as schools, juvenile justice programs, and nonprofit organizations. The degree takes a positive approach to working with youth, and graduates of the program play important roles in the lives of children and adolescents. Students learn how to effectively apply theoretical knowledge and evidence-based research practices that promote healthy development. Courses include contemporary youth issues and youth in cultural contexts. Students can choose to complete a five-credit practicum or a six credit-hour thesis. The online program is 36 credits, and full-time students can complete their degree in two-years. Texas Woman’s, located in Denton, strives to empower women through education and is the largest women’s university in America. The university offers one of the best online human development and family studies graduate programs in the nation. The fully online family studies master’s degree prepares students for careers in family service settings such as community centers, schools, and social service agencies. The program is 34-35 credits depending on the degree route students choose, and students must successfully pass an exit exam prior to graduation. Students complete nine credits in specialized courses and six credits in research, including statistics for research in family sciences and research methods. Texas Woman’s provides a variety of supportive services for online students, and the university’s strategies for success helps prepare students for the rigors of online learning. Online courses are delivered through Blackboard and Canvas learning management systems. Concordia is a liberal arts university affiliated with the Lutheran Church, and its quality academic programs approach learning through the lens of Christian compassion and service. The online master’s in human development and family studies offered by Concordia University is part of the college’s distance learning program. The MA in family science is 36 credits and can be completed entirely online. Online courses are offered consecutively and take seven-weeks to complete. The degree emphasizes preventive approaches to human development within the context of family systems. Courses include systemic dynamics and family decision making. Students enrolled in the program have the opportunity to become Certified Family Life Educators and must choose to pursue the certified-track upon completion of their second course. Concordia stipulates minimum technology requirements for online learning, including a computer, webcam, and microphone. The university supplies students with Microsoft Office. UNA is a public university that was founded in 1830 in Florence, Alabama. The school offers a fully online master's of science degree in family studies that prepares students for careers in government and both nonprofit and for-profit organizations that serve children and families. The 31-credit curriculum includes classes on standard family studies topics but also includes practicums that must be approved, supervised, and evaluated with designated faculty. Students must also complete either a capstone project and a comprehensive examination, or a six-credit thesis project and a thesis defense. All online students pay the same tuition rates, regardless of residency. Applicants must have a minimum GPA of 3.0 and a minimum MAT test score of 388 or GRE scores of 146/verbal and 140 quantitative to be considered. Those who fall short of these recommended requirements may be admitted on a sliding scale. UNA is regionally accredited by the Southern Association of Colleges and Schools Commission on Colleges. SHSU was founded in 1879 and is the third oldest public university in the state of Texas. The school offers an online master of science in family and consumer sciences that is available in both thesis and non-thesis options. This program provides students with advanced, specialized leadership in the fields of dietetics, extension, business, industry, and education. Both thesis and non-thesis options include 36 credits of coursework. Thesis students must complete 15 credits of family and consumer science coursework, three credits of statistics, 12 credits in an approved specialization area, and six hours of thesis work. Non-thesis students must complete 21 credits of family and consumer sciences coursework, three credits of statistics, and 12 credits in an approved specialization area. SHSU is regionally accredited by the Southern Association of Colleges and Schools Commission on Colleges. The school's counseling programs are programmatically accredited by the Council for Accreditation of Counseling and Related Educational Programs. Wilmington offers an online master's degree in applied family science that is ideal for students already working in the human service, education, religious or corrections sectors, and for those seeking entrance to the field. Students must maintain a minimum GPA of 3.0 throughout the program to graduate. Classes are taught in a seven-week block format allowing students to earn their degree in just two years of full-time study. This timeline may be accelerated by some online master's in child development students. This 33-credit program is a practice-oriented degree that is recognized by the National Council on Family Relations as a Certified Family Life Educator approved program. Throughout the program, students are encouraged to design projects that fit their areas of interest and to fold these experiences into the culminating capstone project in family life education. Wilmington is regionally accredited by the Middle States Commission on Higher Education. Murray State was founded in 1992 and is consistently ranked by U.S. News & World Report among the top regional universities in the South. The school offers an online master's of science degree in human development and leadership that was designed to meet the educational demands of students seeking careers in the fields of administration, program development, and other nonprofit career settings. This 33-credit master's in child development online program includes 21 credits of core courses and an additional concentration of 12 credits, which expands a student's knowledge of their chosen career field. The 21-credit core curriculum includes classes in criminal justice, educational administration, intercultural communications, and leadership development. Murray State is regionally accredited by the Southern Association of Colleges and School Commission on Colleges. Online master's in human and family development programs vary by school, which allows you to pick a program that fits your interests and professional goals. Each program has distinct learning outcomes, and curriculum will change based on those outcomes. Some programs emphasize certain specializations, such as youth or family, and all have different course requirements. Some programs may require more credits or core courses than others. However, there are some courses in the field of human and family development that can be found in numerous programs, such as those listed below. Family Relationships and Dynamics: Theories, research, and subjects that affect families are the focus in this course. Other topics include human development or issues that share a common theme. The course is often the foundation for the entire program, and some curriculums include special topics. Administration and Program Management: This course prepares students to work in management and administration for youth and family-focused organizations. The course introduces students to budgeting or finance administration in public and nonprofit organizations. Theories of leadership and ethics may also be included. Aging in Families: These courses examine aging in the social context, the experience of aging as reported by older persons, and the aging network, which includes the systems of care that are in place. Many courses delve into the impact of aging on family and society, with focus on research and policy. Capstone/Practicum: A capstone is when a student integrates what they have learned in their courses with a focused project. A practicum is a faculty-supervised field experience that may include working with children, families, or consumers; a certain number of hours are usually required. HOW LONG DOES IT TAKE TO GET AN ONLINE MASTER'S IN HUMAN AND FAMILY DEVELOPMENT? Online master's in human and family development programs usually require about 36 credits, which can often be earned in two to three years. A variety of factors affect the length of an online degree, including course load, which can vary based on a student's enrollment status. Other influences on program length include course availability, a student's term of enrollment, and hours required to complete a practicum or field component. Some programs offer accelerated options for students who wish to complete a program more quickly. Most programs allow students to complete the degree at an individual pace, meaning the student determines how many credits to take each term based on their own schedules. Some programs operate through a cohort model, where students begin the program together and complete courses synchronously. Marriage and Family Therapist License: All states regulate marriage and family therapists, so students interested in this field should plan to become licensed. Licensure requirements include a master's degree and a period of supervised clinical practice. Requirements vary by state, although many states have modeled their requirements based on the American Association for Marriage and Family Therapy recommendations. Licensed Clinical Social Worker (LCSW): Social work licensing requirements vary by state; a license is generally not required to practice under the supervision of a licensed social worker. An LCSW provides professional opportunities and makes job candidates more appealing. States use various designations, which may include Licensed Independent Social Worker (LISW). Counselor Certification: Counselor certification can include state licensure or national certification. A state license means you have permission from that state to practice counseling, and licensure can be a one or two-tiered system. State licenses vary. A National Certified Counselor credential, or NCC, is issued by the National Board for Certified Counselors. A school's accreditation is important for many reasons. It can affect federal financial aid, the ability to pursue a terminal degree, and transfer credits. Accreditation means that an outside agency has evaluated a university and has determined that it meets certain standards. There is regional, national, and programmatic accreditation, with regional being the highest form of accreditation. There are only seven regional accrediting agencies that are recognized by the Department of Education (DOE), so requirements for accreditation are fairly standardized. Regionally accredited colleges provide the best chance for students to transfer credits or to have their degree recognized when applying to future academic programs. National accreditation generally applies to trade, career, or faith-based colleges that do not have universal standards and need to have their own individual guidelines, so they have their own accreditors. Students considering online degrees should still look for regional or national accreditation and should check to make sure the human and family development degree leads to licensure in their state and in their profession of interest. Regional, national, and programmatic accrediting agencies receive their ability to accredit from either the DOE or the Council for Higher Education Accreditation (CHEA). The DOE is the most important, because without accreditation from a DOE-approved agency, a college cannot offer federal aid to students, and credits may not transfer to other universities. CHEA evaluation is not required, but many accrediting agencies still want the recognition because it is well respected. Without oversight from the DOE and the CHEA, anyone could declare themselves to be an accreditor, and colleges could start accrediting themselves. Prospective students can find a list of accredited schools on the DOE's website. Online master's in human and family development graduates can pursue a variety of careers in social work, counseling, therapy, and religious work. Community and social service occupations are projected to grow 10% from 2014 to 2024, which is faster than average, with many of the counselor and therapist occupations requiring a master's degree. Graduates have the option to work with children, families, and the elderly in many settings. Below, is a list of careers that graduates are prepared for. Mental Health Counselors and Marriage and Family Therapists: Professionals in this job help people to manage and overcome mental and emotional disorders or issues within relationships. They help patients develop strategies that will improve their lives. These counselors and therapists are generally required to have a master's degree and licensure. Rehabilitation Counselors: Rehabilitation can apply to helping people with physical, mental, developmental, and emotional disabilities. These counselors help people to live independently and work in community rehabilitation centers, senior citizen centers, and youth organizations. A master's degree is usually required, and licensing varies based on the position. School and Career Counselors: School counselors help students develop academic and social skills to succeed in school. Career counselors assist people with making career decisions. School counselors are employed in public or private schools and career counselors work in the government, colleges, or in private practice. Social Worker: Clinical social workers are required to have a master's degree and two years of experience in a supervised setting, as well as licensure in their state. Social workers help people cope with a variety of problems and can work in clinics, schools, agencies, hospitals, or in private practice. Substance Abuse and Behavioral Disorder Counselors: Counselors in this field advise people who suffer from alcoholism, drug addiction, or eating disorders. They provide treatment and support to help patients modify problem behaviors. The field is projected to grow by 22% because these services are increasingly covered by insurance policies. While there are a variety of occupations available to graduates who have earned one of the best online human and family development master's degrees, one of the most popular is child, family, and school social worker. Annual mean wages can vary based on where the social worker is employed, as seen in the following table with figures from the Bureau of Labor Statistics. Online master's in human and family development professions usually have a related professional organization that provides networking and continued-learning opportunities. Many organizations are involved in advocacy, licensure, and professional development and promote useful discussions among members such as licensure portability and new applications of counseling methods. American Mental Health Counselors Association (AMHCA): The AMHCA is the leading national organization for licensed clinical mental health counselors. Their mission is to advance the profession through advocacy, education, and collaboration. American Counseling Association (ACA): Dedicated to the growth and enhancement of the counseling profession, the ACA has 20 chartered divisions based on specialized areas. National Association of Social Workers (NASW): The NASW has the largest membership of professional social workers in the world and is focused on the professional growth and development of its members. The Association for Addiction Professionals (NAADAC): NAADAC provides education, clinical training, and certification. They also advocate for the highest-quality services for clients, families, and communities. Students interested in human development master's degrees should investigate affiliated scholarship opportunities, as there are some that are specific to graduate students in the field. Colleges and universities often have scholarships, grants, and fellowships available to accepted students. While many of these resources are merit-based, some also require students to submit a Free Application for Federal Student Aid (FAFSA). A FAFSA is needed if a student hopes to receive any federal aid, and it's a good idea to submit it as early as possible so the college can advise you on your eligibility.